What does egg box labelling mean? Egg box labelling follows a strict set of rules and regulations to convey and confirm consumer safety. This blog post aims to answer most of the areas you would need to know about so that you can ensure your eggs are labelled lawfully. Danro offers a range of labelling solutions to meet all of your egg box label needs. There is a range of other associations or quality control bodies that provide further assurances for consumers that can be applied to egg box labelling. These are generally welfare and safety assurances to help consumers make a more informed choice about which eggs to purchase. Eggs require a code that allows for proper scrutiny of production by the authorities to ensure public health. This information should include the location (address) for where the eggs are produced. This is imperative for all food consumption for public health enforcement. If there is a problem with infection of some sort, the authorities need to be able to trace production to source so they can address any issues with infection, contamination or production methods and prevent any further outbreak. The Registration of Establishments (Laying Hens) Regulations 2003 require all laying hen establishments with 350 or more laying hens to be registered with the Animal and Plant Health Agency (APHA). This includes caged, barn, free range or organic egg-producing hens. If you sell eggs to shops or catering outlets, you must be approved and authorised as a packing centre by APHA so you can grade them as Class A eggs. This number must be stamped on all eggs graded as Class A. Egg box labelling includes “egg stamping”. This is a set code to describe everything needed for consumer protection. As explained above, it is made up of a production method code, a country of origin code (ISO country code) and a Producer ID, supplied by the Animal & Plant Health Agency. The country origin is as per ISO country code – this is applied for all EU egg production, e.g UK for Unitied Kingdom, IE for Irelaned, DE for Germany, FR for France etc. etc. As mentioned above, the Producer ID is supplied upon registration application by the producer to the Animal & Plant Health Agency. This number will be unique to the production unit. There must be a statement on your egg box labelling to explain this to consumers. This is included in our Egg Box Labels available from our shop. Egg Stamping Explanation: 0 = Organic, 1 = Free Range, 2 = Barn, 3 = Caged, UK = Origin, 9999 = Producer ID. Egg Box Labelling: Packing Station No. Where eggs are packed for sale to the public (subject to the criteria found on the APHA website), they will need to have a packing station number. This will be supplied by APHA and must be displayed prominently on the packaging. If you are packing eggs supplied from another egg producer, you will need to stamp the eggs with their details and label your product with the packing station number. This is for infection control purposes for public health. Eggs should be labelled with a best before date. The date applied depends on how the eggs are stored. Eggs refrigerated once sold to the consumer are best used within 3 weeks. Unrefrigerated eggs will lose their quality sooner. Once refrigerated, eggs should be kept refrigerated until used. It is not advisable to refrigerate eggs then unrefrigerated them as their shelf life and quality will reduce dramatically. The consumer advice (see below) recommends eggs are refrigerated after purchase. Class A: They are naturally clean, fresh eggs, internally perfect with shells intact and the air sac not exceeding 6mm in depth. The yolk must not move away from the centre of the egg on rotation. Grade A eggs are sold as shell eggs. Class B: These are shelled eggs. They are pasteurised and this type of egg is normally used in commercial food production. Industrial: These are used for non-food application such as pharmaceutical or cosmetics such as soaps and shampoos. Egg box labelling should include consumer advice on how to store eggs, as well as the explanation of the egg type. By that, we mean whether they are organic, free range, barn or caged. 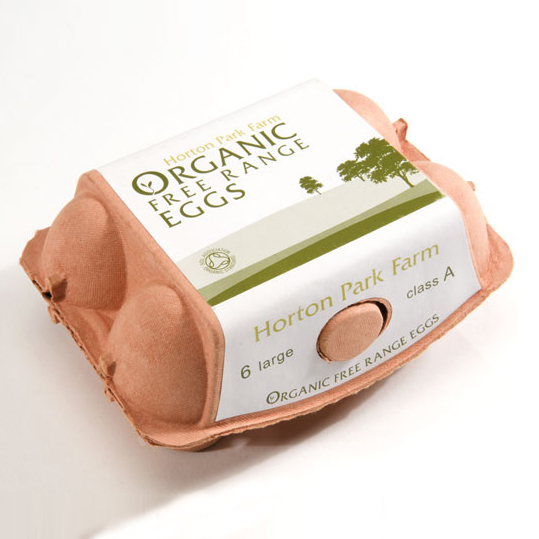 Organic eggs must also be free range and are the highest standard of eggs in terms of animal welfare. Consumer Advice: Keep refrigerated after purchase. There are a number of welfare and consumer associations that may be suitable to enhance the image and quality of your product. Egg production has had a bad rap for treating birds poorly in the past. There are a number of bodies that will give assurance regarding the quality of husbandry your birds may be received. The Lion Logo is applicable to some 90% of UK egg production. This scheme is designed to ensure a code of practice amongst egg producers to limit the risk of salmonella in flocks and reduce the risk of salmonella contamination in eggs. More information can be found here. Other major assurance programs include the Soil Association, RSPCA and Freedom Foods. Do you need egg box labels? You can order what you need directly here or call Natalie now on 01332 865933 to start your order – or complete our online form and we will call you back. Advice received yesterday (23rd March 2017) suggests the bird flu advisory labels found on hitherto free range eggs must be changed. We received a call yesterday from Paul Radnor of the Animal & Plant Health Authority (APHA). We have built a good relationship with Paul over the labelling changes required from the current situation with respect to avian flu. He advised us that due to the time that the housing order has been in place, labelling would now have to indicate free range eggs as “Barn Eggs”. As we have blogged previously, APHA and DEFRA have issues a housing order to improve bio-security in the national flock. This measure was taken to try and prevent the spread of avian flu in commercial flocks from wild birds by housing birds to keep them away from mixing with wild birds. This brought about the first stage of bird flu advisory labels stating: “Eggs laid by hens temporarily housed in barns for their welfare”. The welfare of the national flock is paramount and housing the birds is the right thing to do. However, under EU regulations, birds that are not given free access to the outside (and under specific minimum standards) cannot be labelled “Free Range”. Despite the special circumstances, the EU has been unable to grant any special dispensation despite the circumstances. It is debatable as to whether the UK government is being over-zealous in enforcing the EU rules (which other EU governments may not enforce as keenly). The housing order means that birds have now been housed for an excess of 12 weeks which is the cut-off point to declare free range under the EU regulations. Despite farmers wanting to rear their foul free range, the housing order is preventing them doing so. Many have had to incurr additional costs to caring for their flocks as a result of this order. The new mandated bird flu advisory labels include the same wording as the original eggs but have a clear indicator specifying the eggs are now class 2 Barn eggs. We have prepared new bird flu advisory labels and placed them into stock ready to order. As such we do not have a change over date after which the original bird flu advisory labels may not be used so suggest that egg producers use up their supplies for the time being. 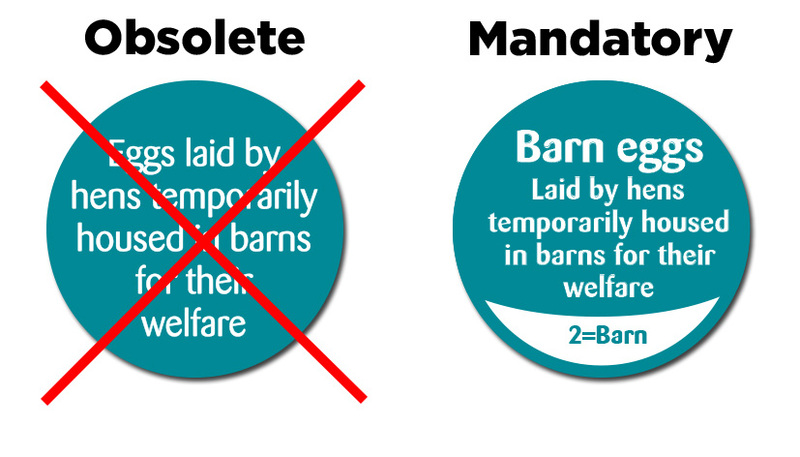 Danro has now prepared temporary Barn Eggs Labels for Free Range Flock egg producers affected by the bird flu precautions implemented by DEFRA. Under EU regulations, to label eggs as free range, they must be kept under specific minimum conditions including access to the outdoors with vegetation on a daily basis. 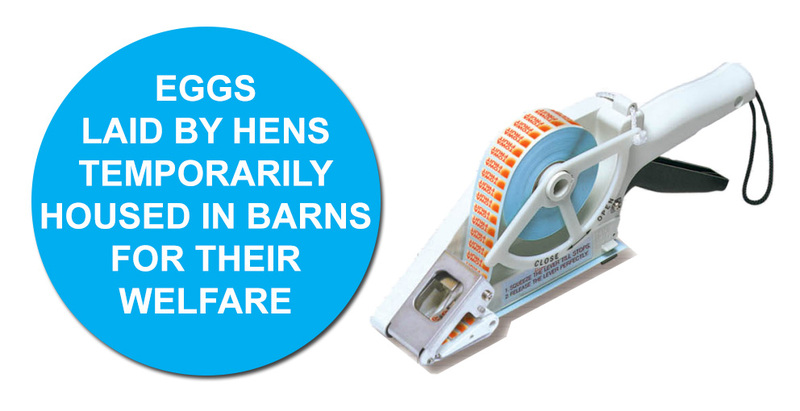 Birds housed under the special measures introduced by DEFRA in December mean that after 12 weeks it is no longer lawful to label eggs as free range but must now have barn eggs labels indicated. Whilst we have our own opinion on the intransigence of the EU Commission with respect to re-labelling free range flock’s eggs as ‘barn eggs’ rather than continuing with the explanation labels introduced at the beginning of February, producers must comply. If you are unable to secure your flock from wild birds; i.e. netting their runs and disinfecting footwear etc. then you must continue to house your flock for the foreseeable future and accept that their eggs must be classed as barn eggs and can no longer be referred to as free range. You can buy these labels directly from us ex. stock by clicking here. You may also buy a TOWA Applicator which will help with bulk application of labels. Please note: All information provided by Danro is provided as is and without warranty. Danro accept no responsibility for the accuracy of this information. Please see DEFRA’s website for exact guidance on the bird flu outbreak and your responsibilities. You may need to amend your free range egg labelling for bird flu as DEFRA’s housing order is lengthened. In December the Department for Environment, Food and Rural Affairs (Defra) ordered that all free range hens – providing eggs or meat – be housed to protect against the threat of the H5N8 influenza virus. As a result, it may be necessary for your products to be re-labelled in accordance with EU regulations. The British Egg Industry Council (BEIC) are understood to be negotiating a solution for egg producers to affix a secondary label to their packaging. 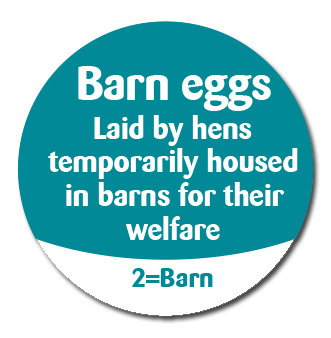 This label is to reflect that their free range eggs will have their free range status downgraded to barn produced in light of the birds being housed inside for more than 12 weeks. The regulations are determined by EU regulations on free range declarations. Danro has taken steps to prepare for the change and can supply you with labels from stock so you can change your free range egg labelling for bird flu. We will be printing labels this month (6th February 2017) with the approved wording for the change. As we understand, the Animal and Plant Health Agency (APHA) are confirming the approved wording for the labels and we will manufacture adequate stock to supply our customers. The labels will be printed as 1-inch roundels in blue with white text. It is expected the text will be “Eggs laid by hens temporarily housed in barns for their welfare” and are priced at £3.90 per thousand. A minimum order of 10,000 labels is required and can be supplied with a TOWA applicator at £79.00. All prices are exclusive of VAT and Carriage. You can buy labels here or the bundled pack of bird flu labels and applicator here. If you require further information, call us on 01332 865933 or fill in the form below. Many people are confused with buying self adhesive labels on rolls so we at Danro Labels thought it would be useful for our customers to have a guide to help them buy their self adhesive labels on rolls. This is to make sure you know the variable specifications we might need to know when you are buying. Along with the shape and size of the label, the main items we will need to know in detail are the material we use to make the labels, the adhesive, the orientation and the winding. The first decision is whether to make the labels using paper-based materials or plastic based material. Paper-based materials use wood pulp as the base composition. Plastic based materials are polymers and are suited to meet certain environmental conditions such as weather or water-proofing. Paper-based materials can be matt or can have a level of sheen added to them. The sheen is achieved by the addition of china clay and is referred to as semi-gloss or gloss. Paper and plastic materials can have direct thermal pigments added. Generally, if you require a direct thermal material, you will use either Direct Thermal Eco or Semi-Top coat thermal. It is possible to get plastic based direct thermal but generally, the costs are high and the same results can be achieved more reliably and cheaper using a plain plastic material and resin thermal transfer ribbon. Plastics used for labelling are predominantly polypropylene (PP) which can be supplied white or clear. Other plastic materials such as PE are also available but cost considerably more than PP. Plastics are very durable and waterproof. They are suitable for outdoors environments and in some cases where the label may be subjected to high mechanical forces e.g. a PAT testing label or tyre label stuck to a tyre being moved around a factory or warehouse. If you plan to print on demand with your labels, the labels may be supplied with blank areas that allow you to print specific information on demand. Sandwich labels are an example where a company may have a standard template that it can then print identification onto. This is a large market and Danro is experienced in supplying hundreds of sandwich labelling systems across the UK. Your choice with respect to thermal printed labels on rolls is normally some form of direct thermal material. If you speak to us first we will give you impartial advice about what solution will work best for you. If the labels have a short shelf-life (say 3-6 months or less), then direct thermal is a suitable method of over printing. For longer duration, we recommend wax or resin ribbons using the thermal transfer method of printing. 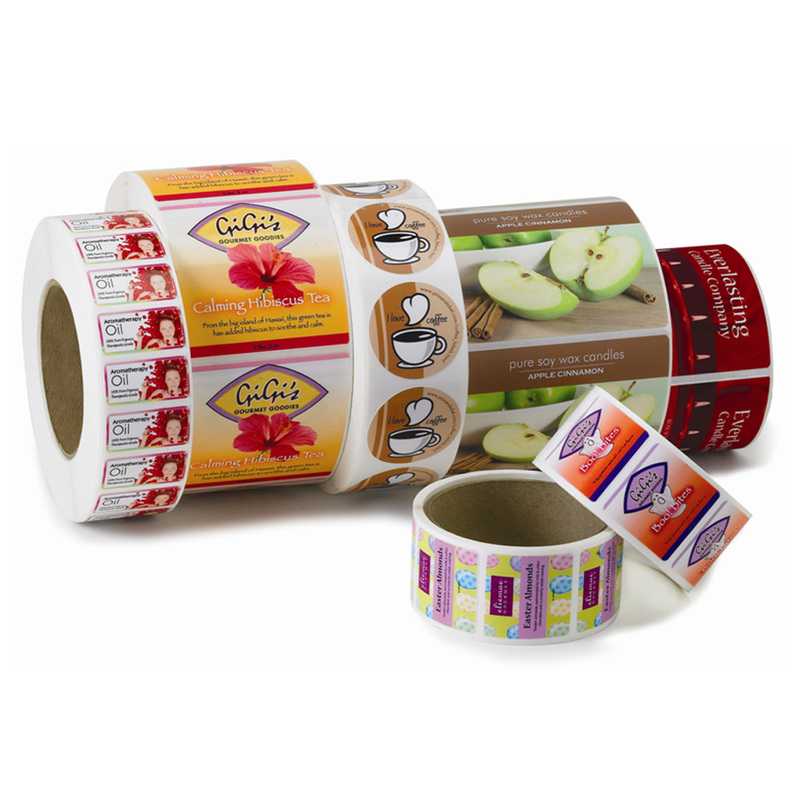 Thermal transfer labels last for years as the wax or resin adheres to the label face. Direct thermal material fades over time and can become illegible after 12 months. There are four main adhesives we offer but specialist adhesives are available – just call us to discuss on 01332 865933. Removable or Peelable adhesive is suitable for items that do not want to have a permanent label on them. Gifts and gift cards spring to mind as an example. Permanent adhesive is suitable for around 90% of applications. Permanent adhesive works well at room temperatures and will stick fast to the item. If you attempt to remove a paper based label from an item with permanent adhesive, the paper will tear. It can be possible to remove plastic based materials with permanent adhesives as the plastic face material can be very strong. Freezer adhesives are suitable for freezing temperatures. It is effectively a stronger version of a permanent adhesive. Freezer adhesives still only work well if the label is applied at room temperature and then frozen; not if applied to a frosted item as the frozen water will form a barrier between the label and the item. High tack adhesives are suitable for specific conditions such as high mechanical force or wet surfaces. High tack adhesives are designed for specific roles so call us on 01332 865933 to discuss what your application is. Labels can normally be described as having an inside winding or outside winding. This simply describes whether the label is facing inside the roll or outside the roll. Orientation can be more difficult but if you look at the label, generally there will be a left side, right side, top an bottom that is evident from looking at the label. 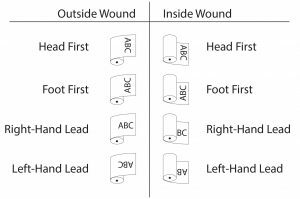 When describing the winding, we will often say head first or foot first to indicate top or bottom of the label. Alternatively, you can describe the label as left hand leading or right hand leading. The diagram shows how the orientations can be described. Danro was bought by Positive ID Labelling in November 2014 and moved from its base in Earl Shilton, Leicestershire to the Positive ID Labelling base in Melbourne, South Derbyshire. Since then, we have fully intergrated and rationalised the businesses into one base although we continue to trade as separate businesses in their own names. Positive ID Labelling MD John Mayers saw the need for Nutrition Labelling solutions in the wake of the EU Food Information to Consumer Regulations coming into full force in December 2016. To that end, the company has invested in developing a robust and easy to use Nutrition Calculation Software for small and large businesses to help them meet the legislation requirements. Nutridata was launched in May 2016 and is availabel to buy online from the Nutridata Website. Food businesses need to get on with delivering this information and can get ahead of the curve using our Nutrition Software on either a pay-as-you-go basis or by buying a lifetime license. You can download a free evaluation copy of the software from the Nutridata Website and if you choose to buy, you can get a special Danro customer discount of 10% by using the coupon code Danro10 when you buy. The discount code applies until December 13th 2016 so buy now! We have moved the Danro website from being a ‘catalogue’ website that just shows what we offer to a fully fledged e-commerce site allowing customers to complete their transactions at a time that suits their needs. There are several benefits for for Danro and customers; not least the saving of £10 on their orders. By allowing customers to complete their orders when they like, we are better able to process the orders through our systems at a time that suits us. This in turn frees up time during the day for our staff to deal with telephone traffic whilst being able to ensure the accuracy of orders are processed properly during quieter periods. This should lead to a reduction in errors and speed up pre-production processes. Additional benefits include a reduction in time wasted to chase late paying customers which not only leads to unproductive costs but also adds to the financial burdens of running a business. 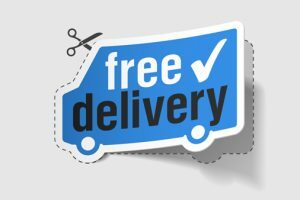 Take advantage of our free delivery options by shopping now.